This image, showing the center of the Milky Way, from the constellation Sagittarius to the constellation Scorpius, was taken by amateur astronomer and astrophotographer Stephane Guisard. New photographs of the center of the Milky Way reveal thechaotic environment at the heart of our galaxy, where a supermassive black holeis thought to lurk. The close-upviews come from two recent projects - one undertaken by an amateur astronomer.St?phane Guisard, an engineer at the European Southern Observatory (ESO) inChile, used his personal 10-cm telescope to take 1,200 individual images over29 nights during his free time. He then combined the photos, which took a totalof more than 200 hours of exposure time, into a stunning mosaic image of the MilkyWay's center. The vista reveals an area of the sky spanning from theconstellation Sagittarius to the constellation Scorpius. Running through theimage is the dusty track of the MilkyWay's disk - the dense Frisbee shape that contains the spiral arms of thegalaxy. Colorfulnebulae - including the pink cloud of the Lagoon Nebula (also known asMessier 8) - where furious star formation is occurring - dot the scene. "The area I have depicted in this image is anincredibly rich region of the sky, and the one I find most beautiful,"Guisard said. 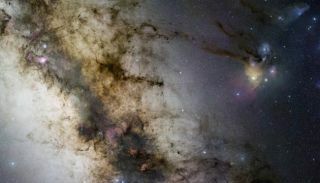 Guisard's image was released as part of ESO's GigagalaxyZoom project, which aims to connect images of the sky as seen with the nakedeye, to close-up views taken with amateur and professional telescopes. Membersof the public can explore the connected images online at http://www.gigagalaxyzoom.org/to zoom in on the sky in extreme detail. Another new look at the heart of the Milky Way comes from NASA'sChandra X-ray Observatory. The deep image, a mosaic of images taken during 88individual observation sessions, reveals the area around our galaxy's humongouscentralblack hole, Sagittarius A*. The region is clouded with diffuse X-ray lightfrom young stars, dying stars, and even emerged poured out by the accretiondisk of material falling onto Sagittarius A*. The images also show mysterious filaments, or strands ofX-ray light that scientists think represent large magnetic structuresinteracting with streams of very energetic electrons released by rapidlyspinning neutron stars. X-rays provide a window into this dramatic inner world, muchof which is shrouded from normal light by a thick veil of gas and dust. The newdata was released at the start of a symposium in Boston called "Chandra'sFirst Decade of Discovery." The X-ray space telescope launched into orbit in July 1999.